Ruby Valley trek is formerly known as Ganesh Himal region is one of the best less touristy hiking trails in central Nepal is a hidden valley between Langtang and Manaslu trail. This newly proposed trekking destination is close from capital city of Kathmandu valley. Ruby Trek is best for those who like to trek in very less touristic area to experience authentic local culture, staying in home and interact with locals residing in region. Main ethnic groups are Tamang, Gurung, Magar and Dalit. Tamang is the majority ethnic group in upper part of Ganesh Himal in villages like Sertung, Tipling and Jharlang whereas there are Brahman, Kshetris and Dalit (considered to be low caste) in the lower part of Ruby Valley. 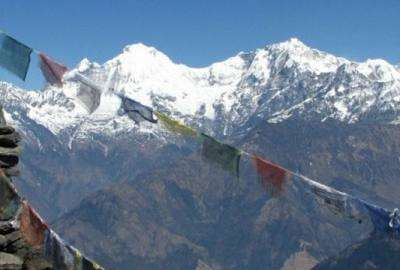 The scenery is splendid, from Pangsang pass and the Singla Pass. The trek goes through foothills and lowland terraced farm lands to ethnic Tamang villages on higher altitude. Along the trail, the trek offers splendid close views of Ganesh himal, Langtang, Bouddha Himal, Hiunchuli and other peaks of central Himalayas. The highest altitude on this trek is the Pangsang pass at the altitude of 3850m from sea level. Pangsang Pass offers one of the finest views on this trek. There are multiple ways to get around it. The trek can be started from from Syabrubesi; some 150km drive from Kathmandu. Syabrubesi is also main gate to classic Langtang Valley trek. Alternatively this trek can start from Dundure Khola (135km) from Kathmandu via Dhading besi. Many people start the trek from Bhalche in Nuwakot and trek via Sing La Pass (4045m). Daily local buses are available to Bhalche, Syabrubesi and to Dundure Khola which is connecting drive via Dhading besi. Yet, Ruby Valley is not a Conservation Area neither a National Park, so this trek doesn’t require a specific trekking permit. As TIMS Card is compulsory for all the trek in Nepal, this is necessary for this trek to. If one is starting a trek or whether ending this trek in Syabrubesi needs to buy Langtang National Park entrance permit that can be purchased at Dunche or in Kathmandu. Trekking agencies are happy to arrange the permit and guide. For Nepal trekking permit information click here. Ruby Valley Trek in Ganesh Himal is not facilitated like other major trekking trail such Everest Base and Annapurna trekking route, basic lodges and home stay facilities are available. Home stay trek is comparatively least cost so that it is affordable most of you wilderness lovers in budget style. If you are looking for comfortable trekking with good accommodation and verities of food facilities, then this trek is not ideal for you. Wilderness Excursion can arrange a fully supported camping trek with best service on your request. Like, mentioned above, there are several options to start and end this trek. Day 02: Trek to Sertung Village (1940m) 7-8 hrs. Day 03: Trek to Lapdung Village (2000m), 4 hrs. Day 04: Trek to Pangsang (3850) 6-7 hrs. Day 05: Trek to Ghatlang (Parbati Kunda at 2230m) 7-8 hrs. Day 06: Trek to Syabrubesi (1470m) 4-5 hrs. Day 02: Trek to Borang (1475m) 6 hrs. Day 04: Trek to Machet (3400m) 7-8 hrs. Day 06: Trek to Dangochet/Betrawati. Day 03: Short trek to Sertung Village (1940m), 3 hrs rest and relax, explore. Day 06: Trek to Somdang (3270m) via Pangsang (3850). Day 02: Trek to Gonga Kharka (2600m), 6 hours walk. Day 04: Trek to Sertung (1950m) view point. Free airport-hotel-airport pick and drop by private car/van. 1 Well experienced, government registered, fluent English speaking and friendly guide. Hotel, sightseeing and food in Kathmandu. 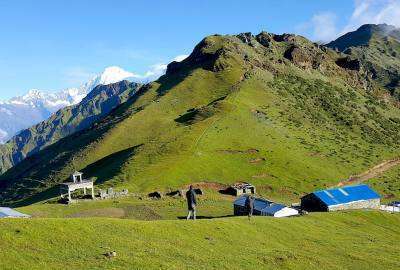 Trip Note: Carrying tents and light meals is necessary is trekking though Singla Pass or Mangni Pass (2975m) though there are yak huts are available. Ruby Valley trek can be combined with Tamang Heriatge Trail Trek, Classic Langtang Trekking, Gosaikunda Trek and famous Manaslu trekking route.